How does it drive? | What Car? Comfort is the main focus of the 3008's driving character. With a cushy ride, decent body control and plenty of grip, there will be no white-knuckle moments and no green-faced little 'uns asking you to pull over so they can get some fresh air. Around town, the steering and pedals feel light, and an automatic hill holder device eliminates the need to ride the clutch when pulling out of steep T-junctions. If you prefer a more spirited approach to your driving, you can plump for the 150bhp 1.6-litre turbocharged petrol or the 2.0-litre diesel cars, which come with dynamic roll control as standard. This device is effectively a hydraulic ram that loads up the outside shock absorber under heavy cornering and helps reduce body sway. Unfortunately, it doesn't do much to improve the steering, which feels rather vague at higher speeds. Of the two engines we drove, the petrol is by far the sweetest. It delivers strong mid-range pull, revs sweetly all the way to the redline and is smooth and quiet when cruising. The 110bhp 1.6 diesel is also pretty smooth and has plenty of punch but you can hear it chuntering away at tickover and when you're accelerating up to speed. In its favour, though, the diesel returns 55.3mpg to the petrol's 37.1mpg. 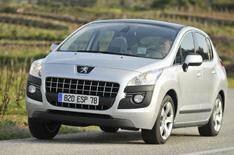 All 3008s come fitted with six airbags and full electronic stability control as standard, but if you occasionally do a spot of towing or trekking up the odd green lane, you may want to specify grip control. This electronic system allows you to select five different settings to boost traction on slippery surfaces. Four electric windows, remote central locking and air-conditioning are standard. On some models you can also specify a head-up display, which projects information on to a reflective polycarbonate panel that allows the driver's eyes to stay looking straight ahead. A variable speed limiter coupled with cruise control, tyre pressure monitoring and automatic lights and wipers are also available.